This is exactly why one must peruse many news sources and try one's best to sort out the truth. Eight U.S. military personnel were killed when their helicopter crashed in southern Afghanistan after reporting engine failure on Sunday, the U.S.-led coalition said. Another 14 were injured, a U.S. military spokesman said. 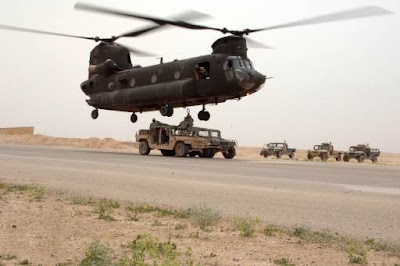 A coalition helicopter has crashed in southeastern Afghanistan after reporting engine failure, the US-led force said, refusing to confirm that all on board appeared to have survived. The chopper came down before dawn in the southeastern province of Zabul, about 250 kilometres (155 miles) southwest of the capital Kabul. It was a Chinook transport helicopter, a military official told AFP on Sunday. Chinooks can carry around 30 people but the coalition would not say how many people were on board or give details while rescue efforts were under way. So L'Agence France Presse, a usually reliable source, says it was a coalition helicopter whereas Reuters says a US helicopter. L'Agence France Presse says there were injuries, but no fatalities. Reuters says 8 died and 14 were injured. Folks, bloggers can be as accurate as "respected" news sources. Here at SPIIDERWEB™ I would probably report 8 people died in a US helicopter crash in Kabul because Reuters is one of several news sources which have said the same thing. They probably got it right. To be fair to the L'Agence France Presse reporter, if you don't know all the facts, "coalition" helicopter is a safe term and quoting a source who says they expect no casualties is also good reporting. Considering the mayhem in Iraq, I'm sure it ain't easy to glean the facts necessary to write precisely. However, I should point out the Reuter's reporter did find the facts as did several others. Reporting is a race. Perhaps the L'Agence France Presse reporter merely went first with what s/he had. I've been burned this way before and came to the conclusion its better to be a little slow on the up-take if it means I can be more accurate. Its each person's call, of course. UPDATE: L'Agence France Presse has caught up on the story. A good sign.